Things are getting very interesting in the Fitness Challenge following the latest event on Sunday. Both male and female categories are extremely close, with many top contenders within a few points of one another. It is so exciting to see so many Sudburians enthusiastically participating in the Fitness Challenge this year! A big thanks to Laura Young and her volunteers for a really well run, safe event. Laura even ordered perfect weather for the day – warm temps and very calm winds. The Island Swim offers distances for all ages, from 100m right up to 2 miles, with the majority of swimmers competing in the 1 mile swim (1 lap around Meda Island). In true fashion of the Fitness Challenge, swimmers of all abilities come out. As Rob Marcolini jokingly says, “my goal is not to get lapped by the 2 milers”! This year was my first foray into the 2 mile distance. I wanted to try the longer distances in both the canoe marathon and the island swim this year, a new challenge for me. I wasn’t quite sure how it would go, having raced the Massey 10k earlier in the day. The swim actually felt great, and I maintained a steady pace throughout both laps. I think swimming is excellent recovery for tired running muscles. Don't get left behind! 4 events are already complete. But there are still more chances to challenge your friends and rivals in the quest to become Mr. or Ms. Fit. There are youth categories, overall categories and age group categories. 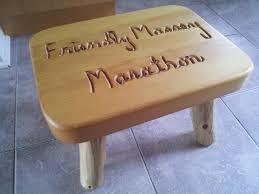 If you win your age group in the Friendly Massey Marathon or Spanish River Half your prize is a milk stool. It's not $1000 or a new pair of the latest shoes or a free trip to a dream location. It's an engraved milk stool. Yet this stool is coveted by those who know the run. They keep coming back in the hopes of finally getting one or for the truly gifted runners maybe collecting a dining room set's worth. The stool has become a defining element of the run. This year was the 38th running of the marathon, the 25th for the half and the seventh for the newish 10k. And the stool has been around for most of the event's journey. For the moment 10kers can only look on with envy at the longer events. At present the stools have not made it to the 10k awards. Runners should not distress though. Rumour has it they may appear in 2015. The process could be nudged by emailing the organizers and pleading your case. If you come out to Massey and run fast you just might become a stooler. Good luck! Conditions were excellent for the 2014 running of the Friendly Massey Marathon, Spanish River Half and Chutes 10k. Temperatures of around 11 deg at 6:00 rose to only about 23deg by the end of the marathon. A cool sunny morning with little wind. There were no excuses for slow speeds on this day. Well, unfortunately there was one good reason for a slighlty less than stellar number. Due to some confusion about course changes over the last 3 years the Chutes 10k actually became a 10.4k run. The organizers realized the error too late to affect a change leaving some less than happy folks at the finish line. We have been assured all will be well for 2015. The Massey group feel terrible and will be sending an apology to the 10k participants. Hopefully the pancake breakfast alleviated some of the sting. 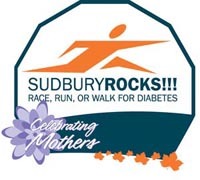 Congratulations to all participants and a special shout out to local runners who took part. One of the things I enjoy about running a race is that you never know for sure how things are going to turn out! This past Sunday I took part in the Massey Half Marathon. I left my house shortly before 5:00 AM thinking that I would have lots of time to driving to Massey before the 6:15 AM race start. Driving along RR#55 I spotted a vehicle that had gone through the guard rails, traveled about 50 feet, flipped a couple of times and was lying on it's side almost in the lake. In a split second, I was worried for what I might find in the vehicle. After calling 911, I ran to the vehicle to find the lone driver was unhurt but still in the vehicle. I helped the driver out and amazingly the driver was fine. This whole ordeal was eating up travel time that I had not counted on. When the driver asked "Can you get my smokes out of my car"? I knew it was time for me to leave and continued onto Massey. Days before the race, a good friend told me that she went through the half marathon registration list and didn't see any of the usual speedy runners registered. Telling me "Hey Brent! I think you can win the race". Okay I thought, thinking that if there were no speedy guys there, I would go out with the idea of running 4:00 /km for the first couple of km and then thought I would back it down a bit. The gun goes off and a couple of guys are stuck to me like glue for more then a couple of KM. Hmmmm Okay, new plan, hold this pace for a few more KM and hopefully they will drop off. Nope -they are still there! New plan again - try and hold the pace again. Trying to survive the race, I went through 10 km in 39:25 and kind of burned up a bit. These two younger guys left me in their dust! Kids these days - No respect for us older runner! Overall I ran the race quicker then I thought I would so I guess that's a good thing. Overall I was third and won my 40 to 49 age group and was rewarded with the coveted Massey Marathon stool. Thanks go out to the race organizers who always do an amazing job pulling the community together to host this even! I'll be back next year when I move up to the 50 to 59 age category.